Jacob Ludwig Carl Grimm and Wilhelm Karl Grimm were born in 1785 and 1786, respectively, near Frankfurt. They were known for their collections of folk tales, collected from oral and written sources, and for their work in linguistics. Grimm's Fairy Tales is a collection of German fairy tales. The youngest and silliest of three sons finds good fortune in sharing his meal with a poor old man. Written as a play, this is a story about neighbors who do not get along. The hedgehog challenges the hare to a contest. The contest is used to settle the differences between the neighbors. However, is the means fair? The sister named Little Two Eyes is put down by her sisters who think she is common. However, she gets magical assistance and has a happy ending. An angry fairy casts a spell on a lovely princess. The spell is made less frightening by another fairy. In spite of all efforts to avoid the spell, the princess falls prey to its power. The spell can only be broken by the kiss of a handsome prince charming. The twelve sons of the king would be killed if the queen had a daughter. She had a daughter and the sons were banished to the forest until they would meet their sister. Hans trades items for ones he thinks are better. FCIT. "Grimm Brothers author page." Lit2Go ETC. Web. 18 April 2019. 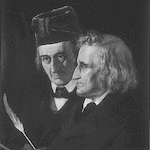 <https://etc.usf.edu/lit2go/authors/189/grimm-brothers/>. FCIT, "Grimm Brothers author page." Accessed April 18, 2019. https://etc.usf.edu/lit2go/authors/189/grimm-brothers/.